We want develop a deep understanding of the political and social issues to organise for action in a way that ensures our campaigns influence both government and communities. Using our Programme for Renewal as a platform, we are actively engaging young people throughout the year to gain a better understanding of these issues which will feed into our ideas competition. We build capacity and facilitate involvement of young people through skills, issues and liaison networks. We unlock all of the talents of the Compass Youth membership through skills networks. We are developing workshops on developing skills of our members to organise in collaboration with both youth leaders & progressive groups. 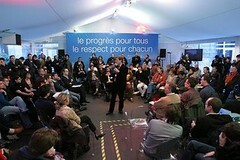 We will feed in ideas from members through Issues Networks to enhance the “Living in the 21st Century” process. We will jointly organise “policy parties” & “kitchen cabinet” debates with the progressive groups we are working with as part of the ideas competition across London and encourage you to facilitate local debates elsewhere in the country where we can. We are also organising workshops on reclaiming the cultural identity of mining communities and young migrant communities. We work constructively with NGOs and act as a recruiting tool by inspiring potential members. We are co-producing a variety of toolkits with NGOs on how to run campaigns. We develop our profile and reach across the media, notably in pioneering innovative ways of promoting our ideas. We want to make Compass Youth, make it visual, make it personal, give it a face. We have re developed our website and launched viral video channels and open source tool to input into the Labour Party manifesto as well as designed eye-catching flyers. 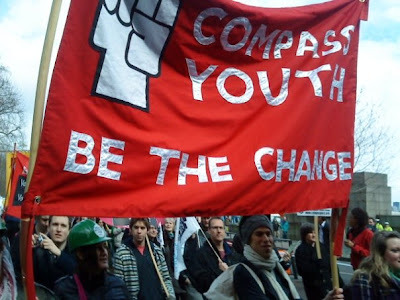 Bringing together all the articles on our blog, we will also produce a user generated pamphlet of how Compass Youth turns ideas into action.